A suicide bomber blew himself up as security forces raided his hotel room in Beirut’s Raouche district Wednesday evening, injuring at least 11 people, in the third such blast to strike Lebanon in less than one week. 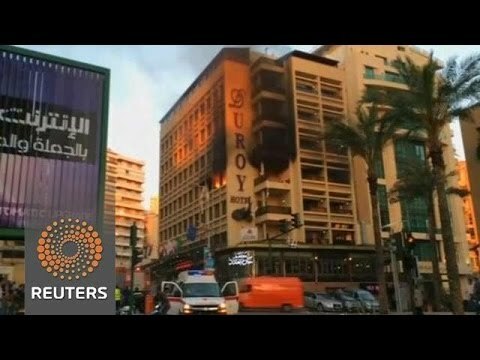 Firefighters rushed to extinguish flames on the third floor of the Duroy Hotel near the Beirut seaside as police and army men cordoned off the area. The interior ministry said that three members of the security forces and a second attacker were injured in the blast, including one policeman who was in critical condition. Seven civilians were also wounded in the attack according, the Lebanese Red Cross said in a statement. “It is noteworthy that it is the security precautions that are preventing the suicide bombers from reaching their targets,” Interior Minister Nouhad Machnouk told reporters outside the hotel, pointing out that the last two suicide bombers were stopped at security checkpoints. He added that a second suicide bomber was injured in the blast and is in custody. The state-run National News Agency identified the suicide bomber as Abdel Rahman al-Hamiqi, born in 1994. A second attacker in the room with his was captured. “One was killed, and the second was injured,” Machnouk said. Both attackers are allegedly from Saudi Arabia, whose embassy is located across the street from the hotel. The Saudi embassy said it was coordinating with Lebanese security forces to confirm the identities of the attackers. “It is Lebanon that is being targeted, not the security forces,” Abbas Ibrahim, head of General Security, told reporters. Lebanese security forces on Friday arrested a Frenchman over terrorism suspicions during similar hotel raids in Beirut’s Hamra district. Police had detained 17 people that day but only the Frenchman remains in custody. A security source earlier this week told Al-Akhbar that the Frenchman was one of four individuals believed to have come to Lebanon to carry out suicide attacks. It was unclear if the targets of Wednesday’s hotel raid were a part of the same jihadi cell sought in the first raid. Five others were also arrested in northern Lebanon earlier Wednesday under suspicion of belonging to a terror cell. The explosion was the third suicide blast to strike Lebanon in less than a week and comes one day after the leader of the jihadi Abdullah Azzam Brigades promised more attacks. The Abdullah Azzam Brigades had claimed responsibility for a number of deadly Lebanon blasts over the past year. A suicide bomber killed a security officer and injured about 20 others Monday night near an army checkpoint just south of Beirut. Another security office was killed and over 30 injured in Friday’s suicide blast in eastern Lebanon. The quick succession of suicide blasts in the country follows nearly three months of relative calm.